When we left Part 1, United (and Ian) had just completed back to back promotion seasons, taking them from the 3rd Division to the top tier of English football. During that second promotion season the BBC chose United to be the focus of a documentary series focusing on all aspects of a football club. You and your family were featured heavily, how did you find it? The documentary series was fantastic. In those days for TV to capture your team's success in such detail was rare. Yes and to capture that season for United, culminating in that game at Leicester was great for the team. Obviously, they focused on me a bit with the story of a couple with a young daughter coming down from Scotland. They painted a picture of me which was quite amazing and one added benefit of that was that we were never short of offers of babysitters again! That's just the Blades fans for you though, a good bunch. Your form and goalscoring record, which you maintained in those first couple of top flight seasons, ought to have drawn some international recognition. Were you ever close to a Scotland call-up? There were times I was mentioned in dispatches North of the Border. My mother-in-law collected the newspaper clippings when I was linked with the Scotland squad and sent them down to me. I had played for the Scotland semi-pro side (a sort of 1st Division Select) whilst at Kilmarnock, but that aside there was one or two mentions whilst I was down here. I believe that I was watched once, one time against Norwich in 1992 where Bryan Gunn, the Norwich keeper, had gone off and an outfield player ended up in goal. I scored the winner that day, but missed three or four chances as well. I had a spell up front when Tony Agana was injured. That first season in Division One started off disastrously for United, yet you played a big part in the turnaround. We reached the 22nd December 1990 bottom of the league and with just four points on the board. Then we faced Forest and that kick started our season. I scored two in a 4-2 win and had another shot that hit both posts and stayed out. I never scored a hat trick in my career in England and Scotland; that was the closest I came. The celebrations at the end, with the crowd running on the pitch, gave it the feel of a promotion winning match or a cup giant-killing. We then won our next game and then from late January through to the beginning of March we went on a run of 8 wins and a draw in 9 games and eventually stayed up in 13th place. Although the league is different now, I don't think anyone will survive from that kind of position again. The following season Dave arranged the Christmas party in August thinking it might help us get over that start of season blip. It was quite a unique thing, but Dave loved the media and they loved him as he was always good for a quote or story. It didn’t really work. United again started the season slowly, but thankfully and over time they developed a consistency which saw them finish in 9th place. That season also saw the return of top flight Sheffield Derbies for the first time in 23 years. How was it to play in the intensity of a Sheffield Derby? The Sheffield Derbies have mixed emotions for me. The build-up to the first was great as it had been so long since the last top flight derby, the buzz around Bramall Lane and the fact it divided the street where I lived was superb. 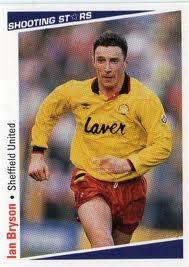 You had a key role in the first of United’s two goals at Bramall Lane in the 2-0 victory in November 1991. I was put through with a through ball by John Gannon and was one on one with Chris Woods. I hit it to his right and he palmed it out. Dane (Whitehouse) a good local lad was running in and we were 1-0 up. The whole day was unbelievable. Sadly, I missed the return game at Hillsborough, where we did the double, through injury. That was the game where Bobby Davison scored two goals on his debut and United won 3-1. I was gutted to miss out on the Steel City Semi at Wembley in 1993, that’s a big regret. It's so rare to get the chance to play there and it seemed like my chance had gone. I had been on a run in the side up to the Quarter Final replay at home to Blackburn Rovers and I had to go off injured with the re-occurence of a hernia injury. It had been operated on earlier in the season and I had to have another operation and in the end that was effectively the end of my career at United, although I didn't know that at the time. I watched on as Pembo fired in the winning penalty in the shootout. At that point I didn’t think I would be missing out on Wembley, just a semi-final versus Wednesday. Then the semi was moved to Wembley. Is it hard to look back on the semi at Wembley? My main memory of the semi-final was Mel Rees. We were desperate for Mel to lead the team out at Wembley but the FA wouldn’t allow it, so he walked around the pitch beforehand. I get choked up thinking about it now. Credit to the Wednesday fans that day, the reception from around the stadium was amazing, every fan stood up. On the night we spoke, Bolton Wanderers were playing Spurs live on Sky Sports and Fabrice Muamba had walked out to take the acclaim of the Reebok crowd. We both admitted to having a similar emotional feeling watching Muamba that night. A positive memory of that time, must be the midweek game against Spurs when United thrashed them 6-0? You scored twice I recall. I've got a clipping from a newspaper on our memo board at home with a picture of me and Brian Deane taken on that night. We ended a six game winning run for Spurs and inflicted their worst defeat for 15 years - scoring twice in games like that were the stuff of boyhood dreams! How was Dave Bassett to play for, as tough and straight talking as his public image suggests? Harry often had a go and rarely gave you praise, but that was his man-management style. He always said I was a better player when he kicked me. He was probably right. Deep down you knew what his methods were, but it was sometimes hard to take. That was the way some managers worked back then. You either, bowed down and disappear, or you rolled your sleeves up and got on with it. How did your departure from Bramall Lane come about? It was strange really. We had just gone through pre-season and Harry took me on one side and told me Rotherham United had enquired about me and was I interested. I didn’t know what to do; I took it from that I wasn't going to figure much in the coming season if Harry was willing to tell me of interest. Therefore I asked him to circulate my name and see what came of it. He then said he didn’t mind if I left, I had real mixed emotions, I didn't want to leave, but had to do what was best for me. What did you miss about Sheffield? Everything and everybody at Sheffield United and being in Sheffield was great. We lived in North Anston and our best friends are a couple from there who I met walking the dog in the fields. This guy had a couple of dogs and I used to chat away with him and I got to know him, well I thought I’d got to know him. It turns out after that he just used to nod his head as he didn’t have a clue what I was saying! Both him and his wife became our best friends. My wife has cousins and one of them bizarrely lived in South Anston; so of all the places I could have ended up in England we went where there was family nearby. All little coincidences. I went from Scottish First Division to Division 1 (which then became the Premier League) at United, the kind of events that footballing dreams are made of and no one can take it away from me. The fans were brilliant, the stadium (even though it has changed for the better since) was great, it was just a great family club. Every time I go back you get such a great welcome. We have reunions now and then and you always get a lot of players turning up, which say a lot. Everyone at the place from office staff, through to Frenchie (Derek French the physio) and Geoff Taylor the assistant manager had the same ethos. In Part 3 we talk about a brief spell at Barnsley, captaining Preston to a title, playing alongside a future superstar and he did after his final league season at Rochdale.